I finally got around to reading the 2018 LinkedIn Workforce Learning Report, and I could not have written a better pitch for SkillsCamp. The report looks into the state of workplace learning year over year. LinkedIn surveyed ~4,000 professionals from North America, Europe, and Asia. This included: 1,200 Learning & Development or HR professionals who influence L&D budgets, 400 people managers, 200 executives, and 2,200 learners/employees. They ask each group about biggest priorities, challenges, opportunities, and more. The #1 priority for all levels is to build soft skills. Especially in the face of digitization, automation and, let’s face it, robots, the most important skills are the human skills or “soft skills”. Managers are critical in the effectiveness of workplace learning. 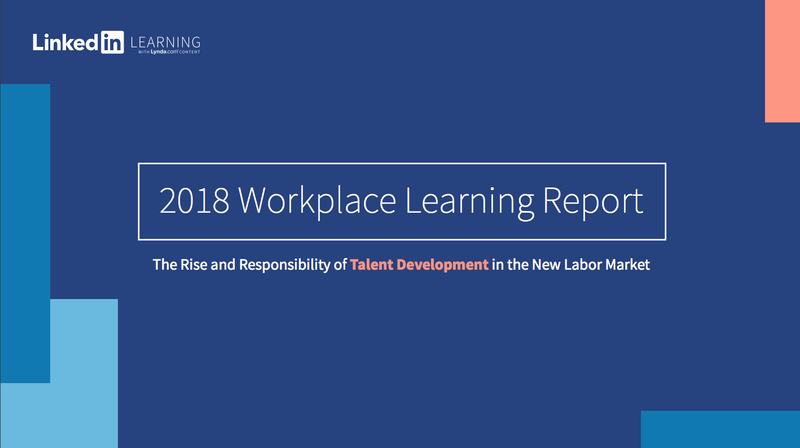 According to the report, the biggest challenge facing talent developers is getting employees to make time for learning. It makes sense. When you’re bogged down in your day-to-day work, you don’t want to give up even one hour for learning. The second biggest challenge facing talent developers is “getting managers involved”. Funny enough, this would likely solve challenge #1. If your manager has made this a priority, gave you time, and followed up with you, 56% of employees say they would spend more time learning (p. 22). So, managers, we need you to get on board this learning and fast! Even though soft skills are the #1 training priority, there is also a trend moving towards digital learning, especially in larger companies (p.17). Another name for soft skills is often “people skills”. Though I’m an advocate for digital “just-in-time learning”, I’ve seen the most success when these people skills are learned with other people. We must consider this when building out our soft skills plans. As of 2018, only 1 out of 3 talent developers would recommend their own programs. That’s actually up from 2017! And, that drops even lower in the millennial demographic. That is unacceptable. To me, it’s like selling you a plumbing services that will only work for a short bit. It’s a Band-Aid solution that will only tie you over in the meantime. The biggest priority for workplace learning professionals is soft skills development. We couldn’t agree more. We’re here and ready to help organizations with development in that area. Moreover, I am making the personal promise that the net promoter score of our programs will be above 33%. Right now, I would recommend 100% of our programs and I strive to have our net promoter score at 100% among our clients as well. Soft skills are the future, and all things considered, I’m happy others are seeing the need. I can’t wait to support your efforts. SkillsCamp is a soft skills training company. We work with businesses and educational institutions to help build soft skills in your staff and students. Through workshops, programs, online content, and consulting, we teach skills such as communication, time management, emotional intelligence, and more. You can learn more about us by watching video below or checking out our website at skillscamp.co.